This recipe (adapted courtesy of diabeticgourmet.com) and photo are courtesy of MSD. Combine eggs, water and pepper in a small bowl; whisk gently to blend the whites and yolks, but not to make them frothy. Heat the olive oil in a 10-inch, non-stick skillet over medium-high heat, tilting to coat the bottom and sides. Once the oil is hot, pour the eggs in. As the eggs start to set, lift the edges so the uncooked egg mixture flows underneath. Cook until the eggs are set and no visible liquid egg remains, about 1 1/2 to 2 minutes. 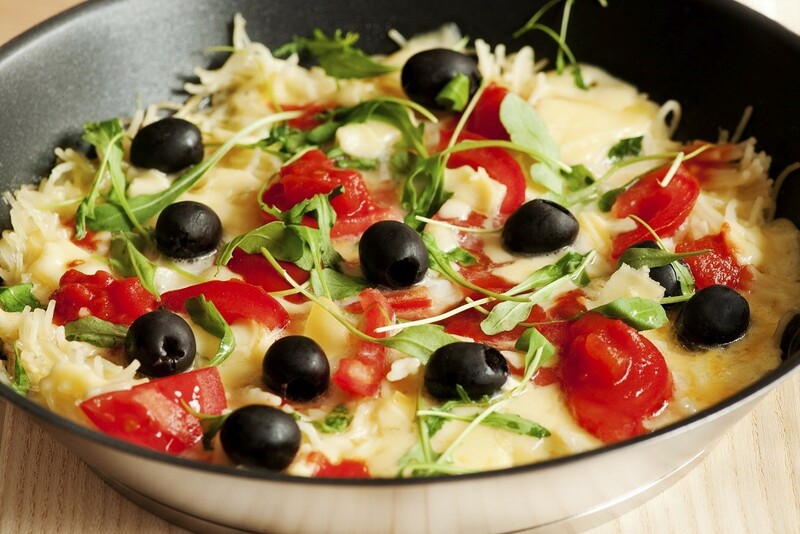 Top half the omelette with tomatoes, cheese and olives; sprinkle with parsley and herbs de Provence. Flip the unfilled half of the omelette over the top. Heat until lightly browned on the bottom, then slide onto a plate to serve and garnish with parsley sprigs or arugula. Note*: If you need to restrict cholesterol, use ¾ cup egg substitute, or use some egg whites in place of a whole egg(s). Whenever possible, use fresh ingredients such as fresh tomatoes instead of canned varieties as they may contain high amounts of preservatives and sodium. White cheeses like feta, goat or mozzarella are lower in saturated fat than hard cheeses. For extra fibre and a more colourful dish, add grated zucchini, baby spinach and mushrooms.